Size: 2 mm, ovipositor 2 mm. So much for covering them with netting! A few days ago I gathered a number of goldenrod twigs with small galls, like the ones here. I put them in several containers with water, covered them with netting and put them by the window. Luckily the window stayed closed, because these three managed to escape (at least I am pretty sure that they didn't come from somewhere else but from the galls) and I found them. This photo was taken on 7/13/09 but I am not putting the date in the field. They appear to be three different species of goldenrod gall fauna. My torymid contact had a bit of a lapsus in placing this. It belongs in the advenus species group, which is where solidaginus belongs. Moved from bedeguaris species group. Identified by my torymid contact, who says it is probably Torymus solidaginis. 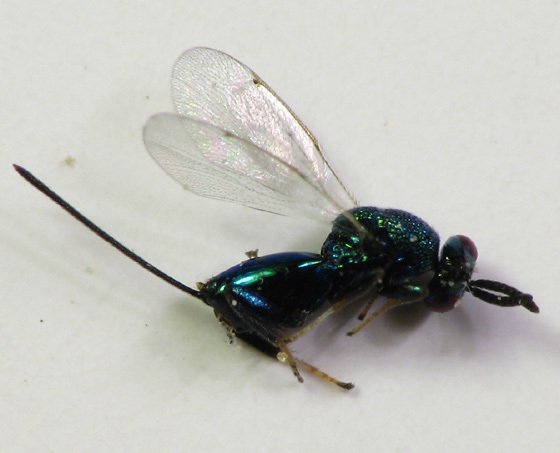 The metallic green coloration, sculptured thorax, long exerted ovipositor, fore-wings with long marginal wing veins and setae, laterally compressed abdomen, and swollen hind femurs indicate a female chalcid wasp in this subfamily. Torymidae are mainly solitary and primary ectoparasitoids of the larvae of gall-forming cynipid (gall wasps) or cecidomyiid (gall gnats).